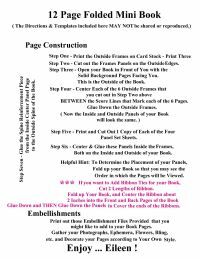 All you need to Create this Photo Keepsake Book is Sheets of White Cardstock for Printing, Your Photographs, and some Ribbon for a Closure. 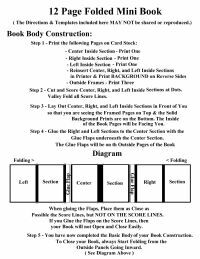 Complete Instrcutions and Files are provided for you to Create the Base of the Book and then to add Printed Page Panels and Embellishments for Decorating. Your Finished Flip Book will measure 6.50" in Height and 29.00" in Length. Because of the Construction Methods you will use, it will be sturdy enough to stand as an Open Display on a Shelf if you wish. Easy to Construct and Fun to Embellish! Raw Graphics with Kind Permision of The Graphics Fairy and Tiramisu. You will receive your download as a Zip File within 24 hours of making your payment. This is a Seneca Pond Crafts exclusive design, and no commercial licensing is required, except you may not resell or share the Digital File, Templates, or Directions - Enjoy!